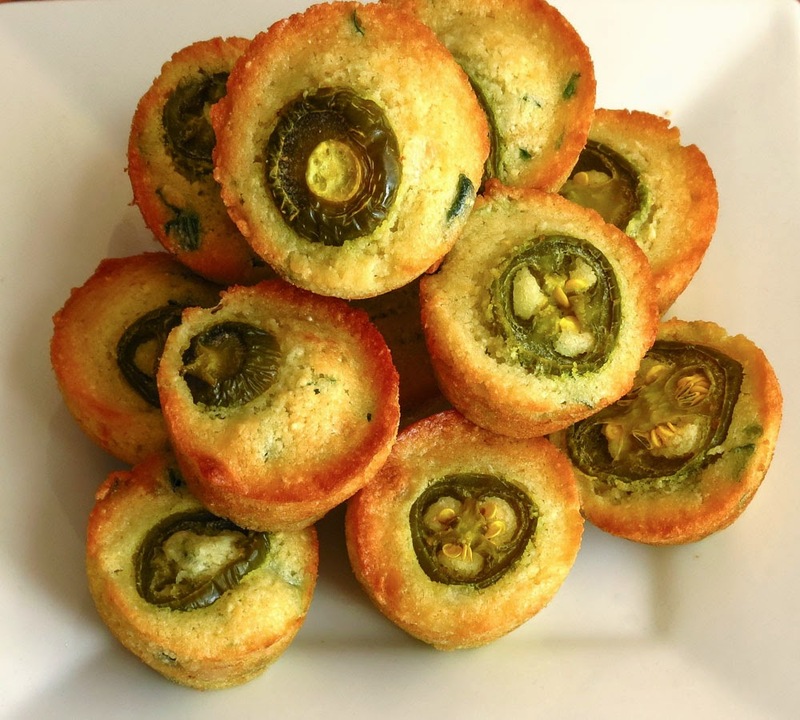 While jalapeno-topped little bites may look like ghoulish eyeballs, they have nothing to do with Halloween, not this month anyway. During football season these sweet, chile-packed, cornbread appetizers will score extra points for flavor at any tailgate gathering. Pile them in a basket and serve warm, alone or with some whipped honey butter or pepper jelly. 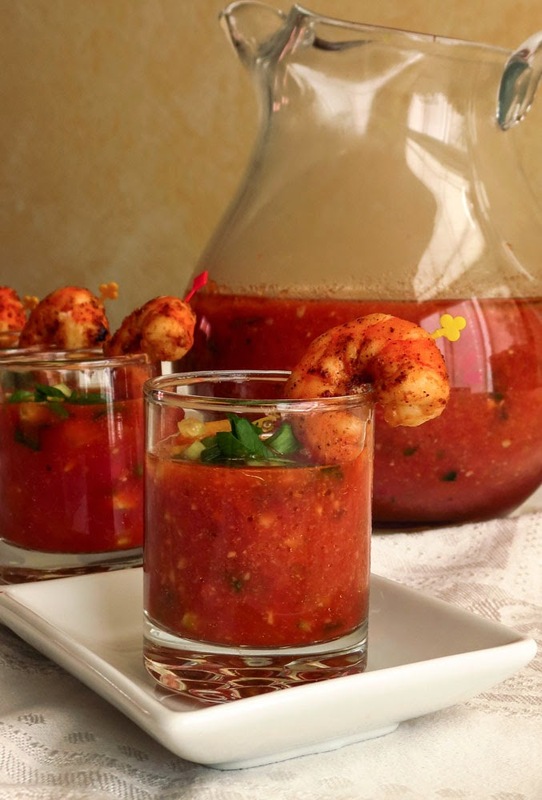 Pair them with ribs or wings, or anything slathered with barbecue sauce. Smother them with chili for a heartier nibble. Go ahead, grab one and take a bite; you'll smile and grab another! The batter is sticky so use your fingers or a small, oiled cookie scoop. 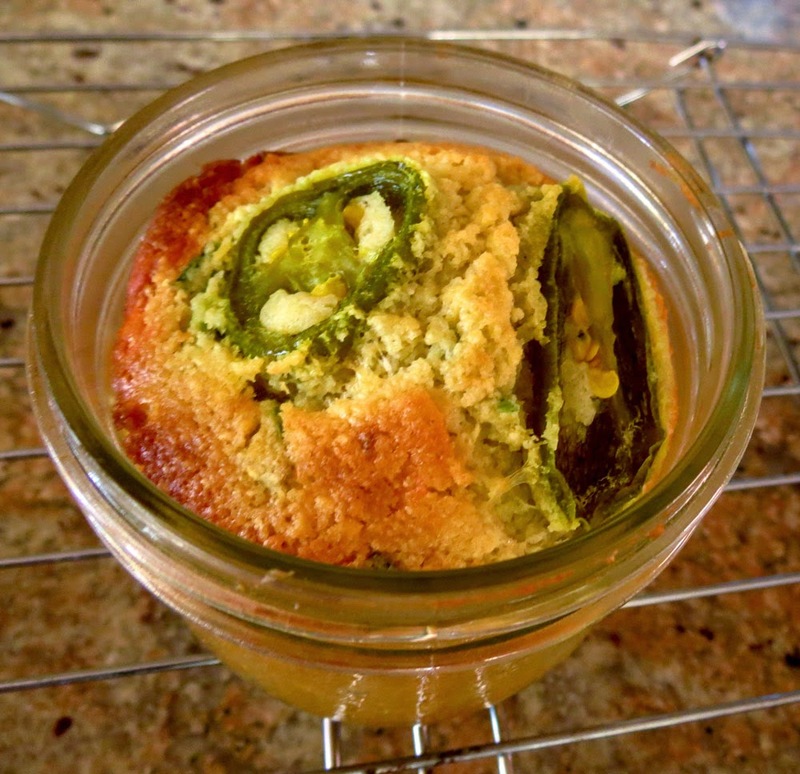 Topped with a jalapeño ring or plain, cornbread mini muffins make tasty snacks and delicious accompaniments to chili and chowder. 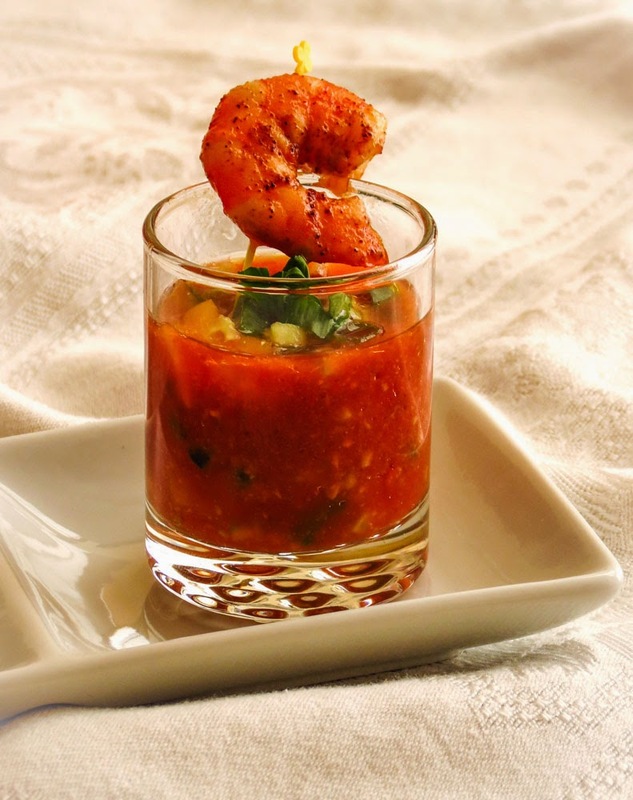 The muffins easily size up into larger muffin tins or even jars, perfect to split and cover with Cajun Barbecued Shrimp (think Shrimp and Grits) or with Sausage Gravy or Chili, just hold back on the sugar. On the rare off-side chance that you have some muffins left over, build a savory breakfast strata. Another batch baked in canning jars was easy to transport and serve. Preheat the oven to 350 degrees F. Lightly coat an two 12-cup mini muffin tins with cooking spray. Wet ingredients: Use a large mixing bowl and stir together the melted butter and sugar. Whisk in the beaten eggs and milk. Add the Poblano chilies, cheese and onion and stir until well mixed. Dry ingredients: In a medium mixing bowl, whisk together the flour, cornmeal, baking powder and salt in a medium bowl, blending thoroughly. Add the flour mixture to the eggy batter and stir until smooth and well combined. 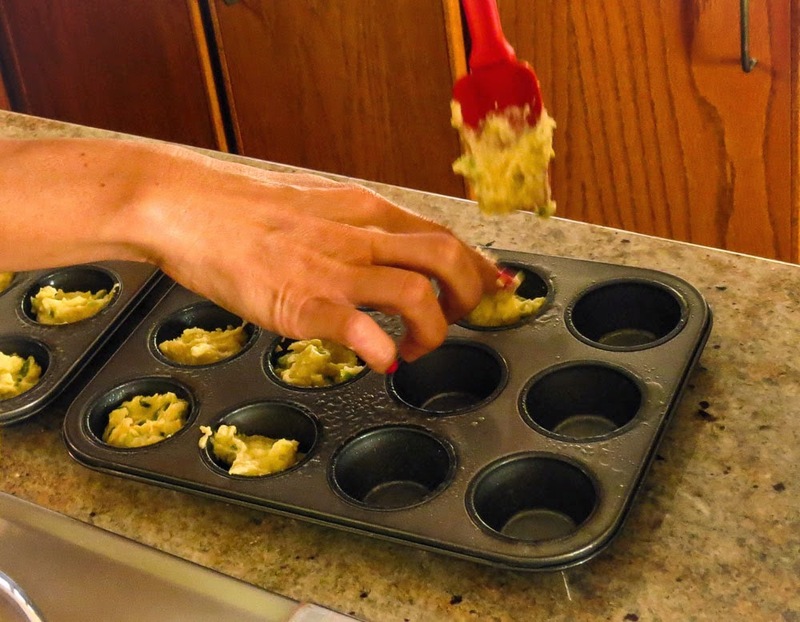 Spoon the batter into the prepared mini-muffin pans, filling each cup about ¾ full. 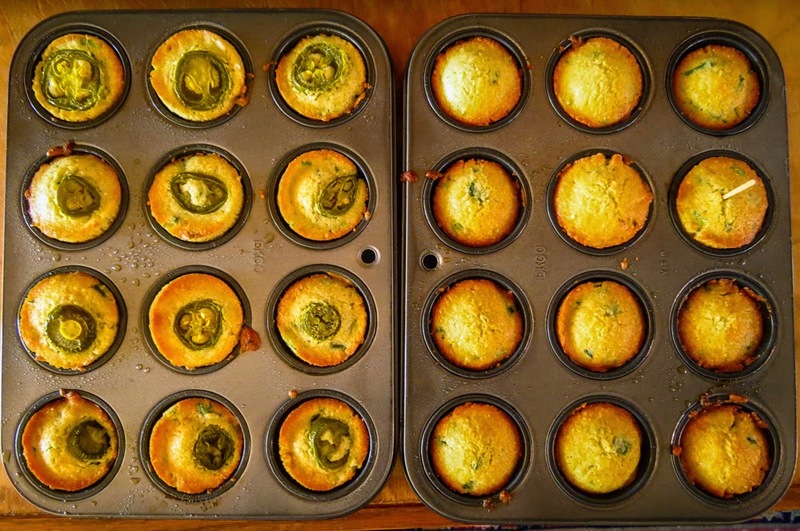 Top each muffin with a Jalapeno ring. Bake on a center rack in the preheated 350 F oven until a toothpick or tester poked into the center of the cornbread comes out clean, about 15-20 minutes. Remove from the oven and let the cornbread rest a few minutes until they pop out of the pan easily. Serve warm, with a little honey on the side... or butter... or better yet, honey butter. Note: Bob's Red Mill is a sponsor of #10DaysofTailgate, but I purchased my own cornmeal. 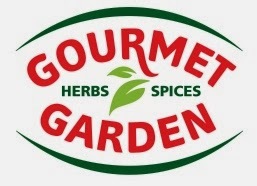 I love this company and have used many of their high-quality products in my home kitchen and boat galley for years. This is it, the very last day of #10DaysofTailgate. Have you checked out the awesome collection of 14 prizes that are available from our generous sponsors? Get with it! Click HERE to go to the sponsor info and enter the giveaway. Don't miss this final opportunity. Unless you are an avid football fan, tailgating is all about the food; rib-sticking dishes like sliders, brats, wings, chili, anything with barbecue sauce. After a few nibbles helpings of these favorites I crave a lighter, healthier bite and head for vegetables... something crunchy beyond the crudités and dip. Toss a penalty flag, call a foul and any eject all soggy, wilted, overdressed salads from your tailgate party. 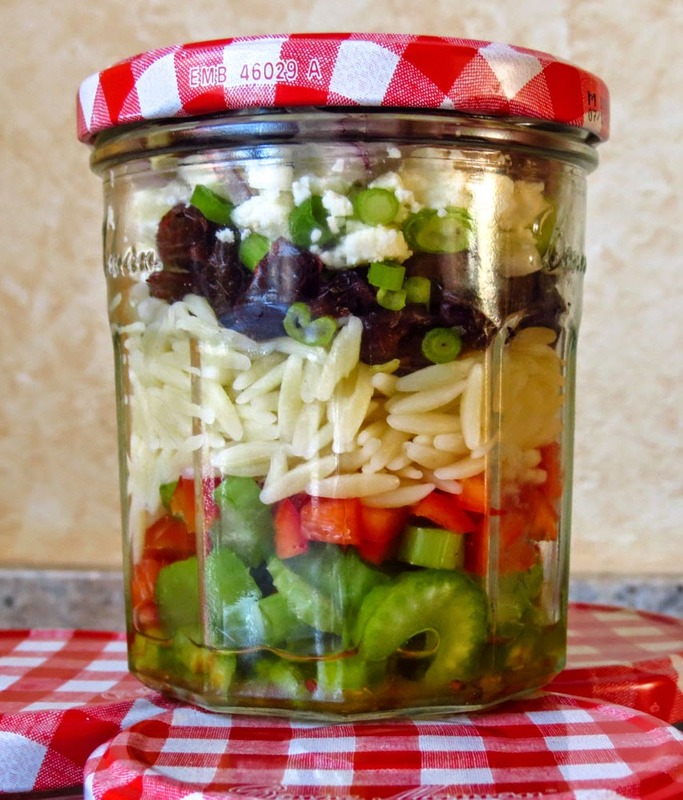 Go with a fresh approach - layered salads in glass jars. You can adapt one of your favorite recipes, experiment with a new recipe, or play around with interesting ingredients just for fun. The secret, if there is one, is in the layering. Begin by spooning 2 to 3 generous tablespoons of the salad dressing into squeaky clean containers with lids, like my repurposed 13-ounce jelly jars. Top this with a layer of firm, crunchy vegetable(s) that won't soak up the liquid. Add additional ingredients, pressing each layer firmly as you go to minimize the exposure to air. 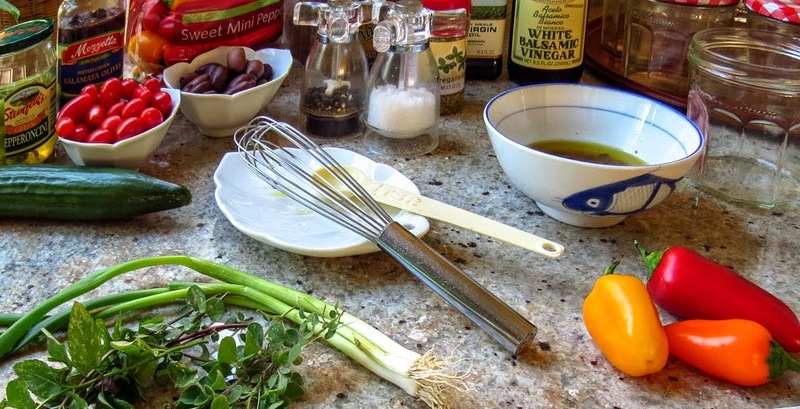 Leafy greens and fresh herbs work best on top. Note: fill your jars completely; don't leave empty air space on top as I did in some of these photos. Screw on the tops and that's it. The salads are good to go, or chill and hold. 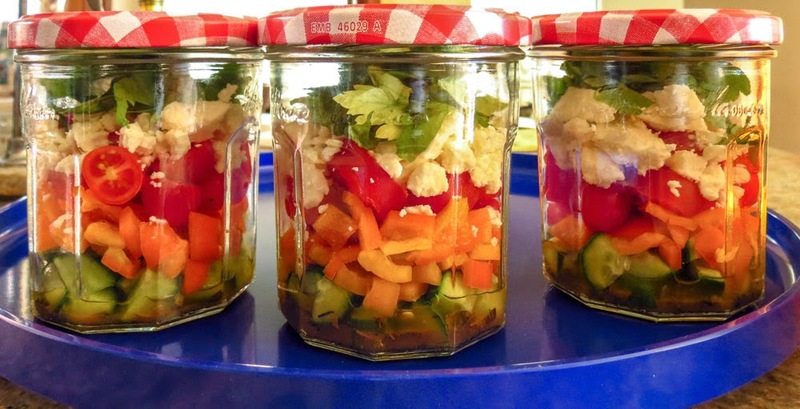 Salads in jars are quick to prepare once you have your ingredients prepped. Think mise en place. They store well, staying fresh in the fridge for several days, and are easy to stack and transport to any event or even to your work desk. Score! 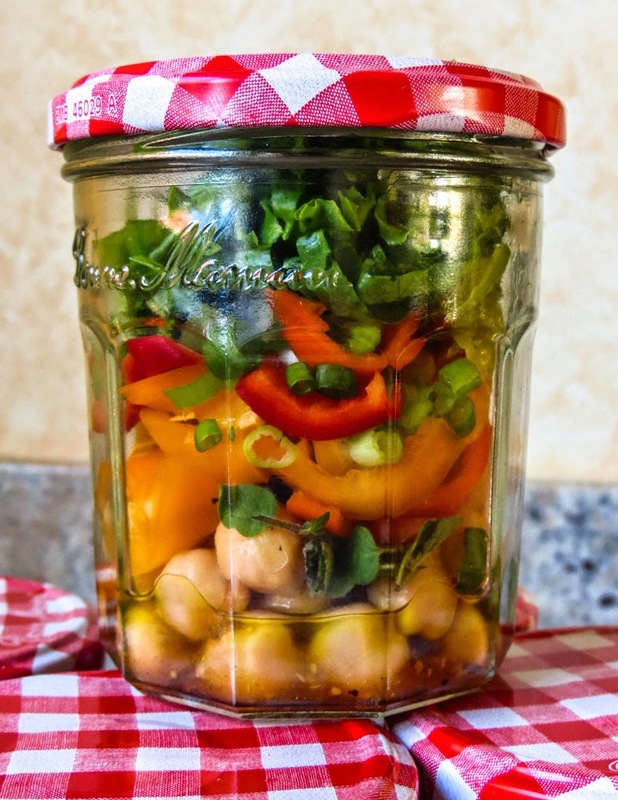 Shake to distribute the dressing and enjoy straight from the jar, or empty the contents into a bowl if you prefer. I like to set out a variety of ingredients and build new combinations, change up the dressings, try different herbs and toppings. Go ahead, get creative and play with textures and flavors. Build this salad with fresh local produce for an extra flavor boost. Salty feta and licoricey basil really pop this classic. 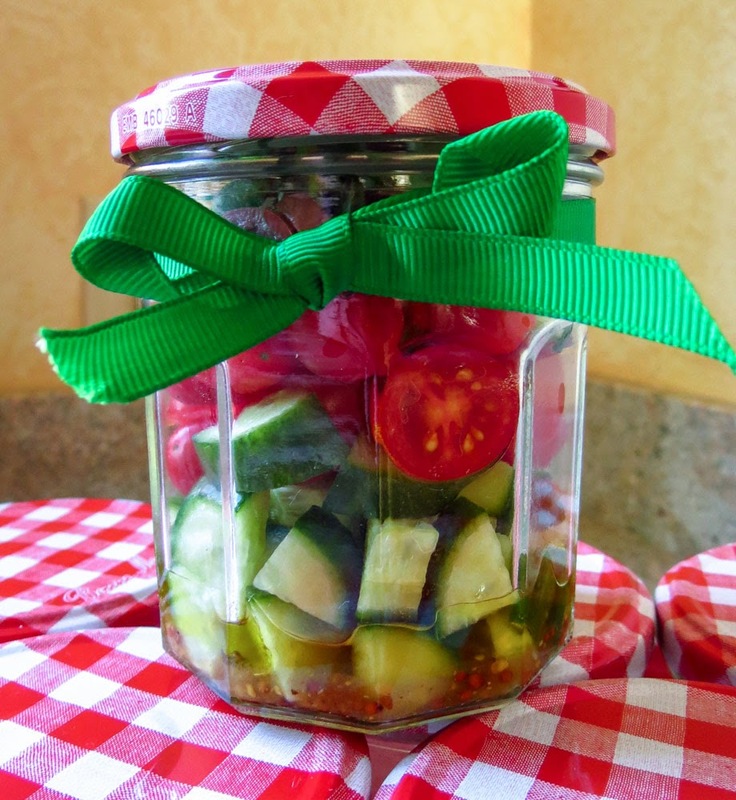 Diced hothouse cucumber, green onions or red onions, yellow and orange bell peppers, halved grape tomatoes, diced or crumbled feta cheese, fresh basil or flat-leaf parsley, pitted olives or pine nuts if you like. Whisk together 1/2 tsp Gourmet Garden garlic, 1 tsp dried oregano, 1/2 tsp Dijon mustard, 2 oz red wine vinegar, salt & pepper to taste. Add 4 oz of good olive oil in slow dribbles and keep whisking until emulsified. Mint and honey balance the slightly bitter bite of kale (or radicchio) in this pasta salad. 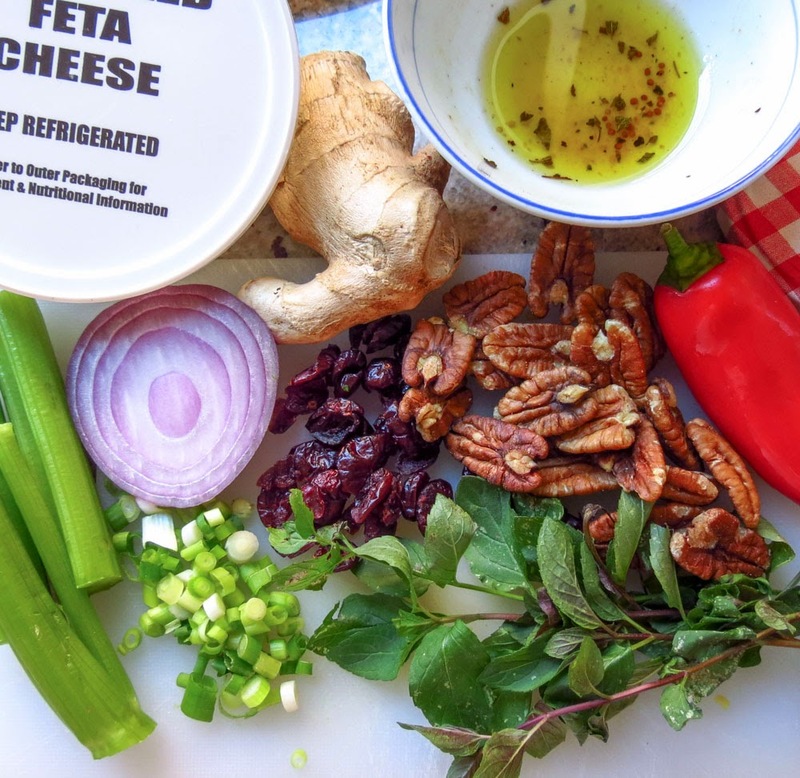 Chopped celery, roasted red peppers, cooked orzo, purple kale or radicchio ribbons, green onions, goat cheese, fresh mint leaves and pecan bits. Whisk together 1 Tbs honey, 1 tsp Dijon mustard, 1 tsp dried mint, 2 Tbs white balsamic vinegar, 3 Tbs good olive oil, salt & pepper to taste. #10DaysofTailgate is approaching its end. Have you checked out the prize packages and entered yet? Click HERE to view our generous sponsors and enter the giveaway. Why "Beast Mode"? Well, if you had to ask, you obviously aren't a Seattle Seahawks fan. Traditional Boston baked beans rely on long, low and slow cooking and the flavors of molasses, brown sugar and dry mustard. 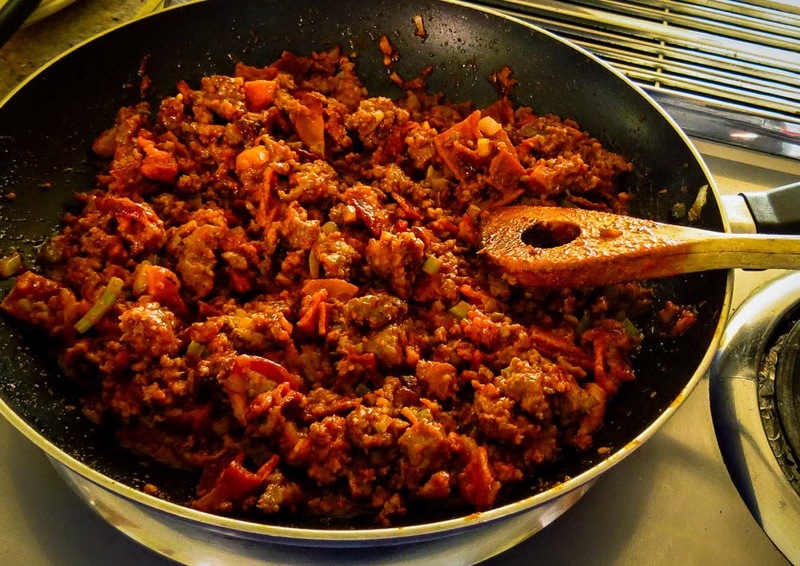 Beast Mode baked beans break tradition to feature meat, beef and pork - a lot of pork - aggressively seasoned with an assortment of zesty hot sauces. You will find beans in every forkful, but your taste buds will agree that it's all about the spicy flavors of that saucy, meaty mix. Note: Smoked pork hocks or neck bones add a subtle smoky back note, you know it's there... almost. Smoke is a good thing, but salt can be an issue. Smoked meat is typically too salty to play nicely with other ingredients, a result of the brining I think, and boiling it or soaking it overnight can help leach out some of the sodium. Add the smoked pork chunks to a pot of cold water, bring to a rolling boil, drain, rinse and repeat. Cool and pull the meat off the bone before using. 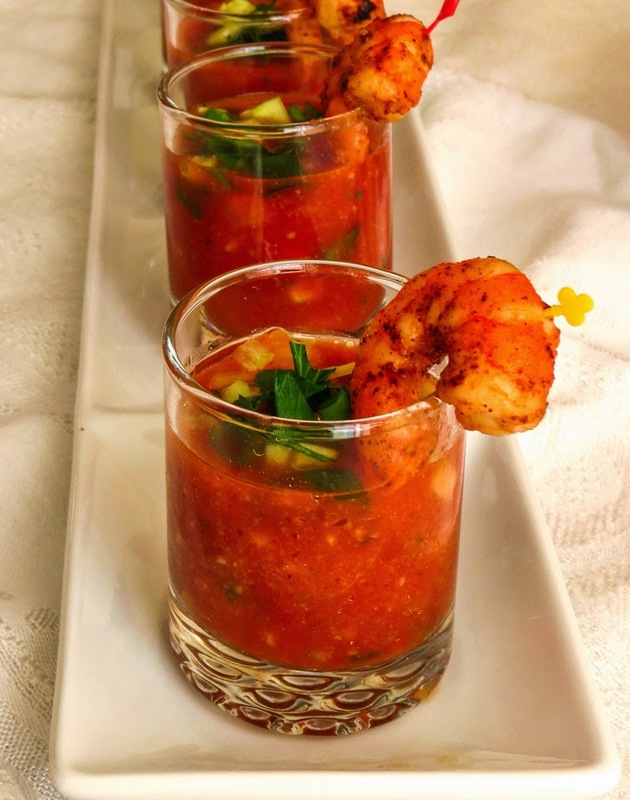 Discard any large chunks of fat and shred or cut into small bite-sized pieces. Or skip the smoked pork bones and substitute more cooked, smoky bacon instead. 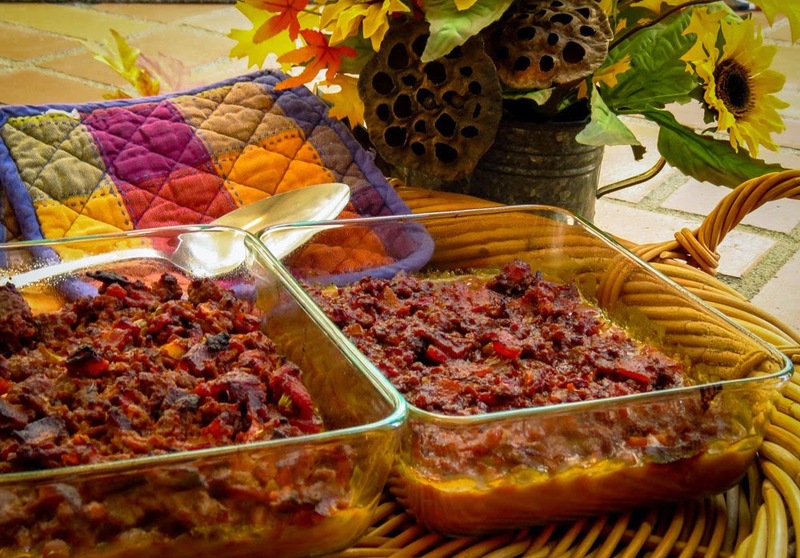 Do you think of baked beans as just another boring side dish? Time out! Blow the whistle on that action and send in a new play! Beast Mode Baked Beans score points as winning tailgate fare. 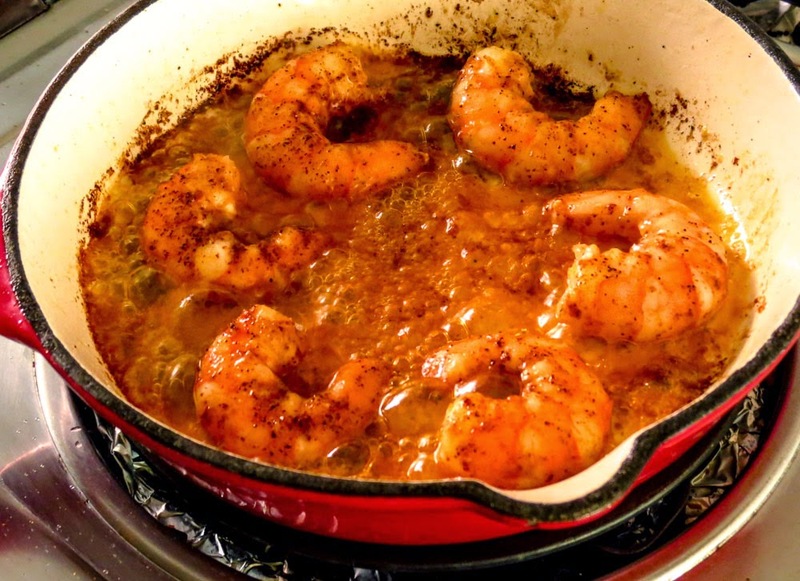 Start out light with the hot & spicy seasonings, then crank up the heat to your taste after step 3. Ready to experiment? Try a squirt or two of El Diablo Smokey Chipotle*mustard or an Intensity Academy hot sauce instead of your favorite Tabasco or Sriracha. Cook the bacon in a large skillet until crisp; drain and set aside to add to the meat mixture later. At the same time, in another large skillet, brown the beef and pork sausage. When no longer pink, add the green pepper, onion, celery and garlic, sauteeing until tender. Drain off any remaining grease. Add all other ingredients except the beans. Simmer 5 minutes. Taste and adjust seasonings. Taste again. Chop or crumble the cooked bacon and add to the meat mixture. 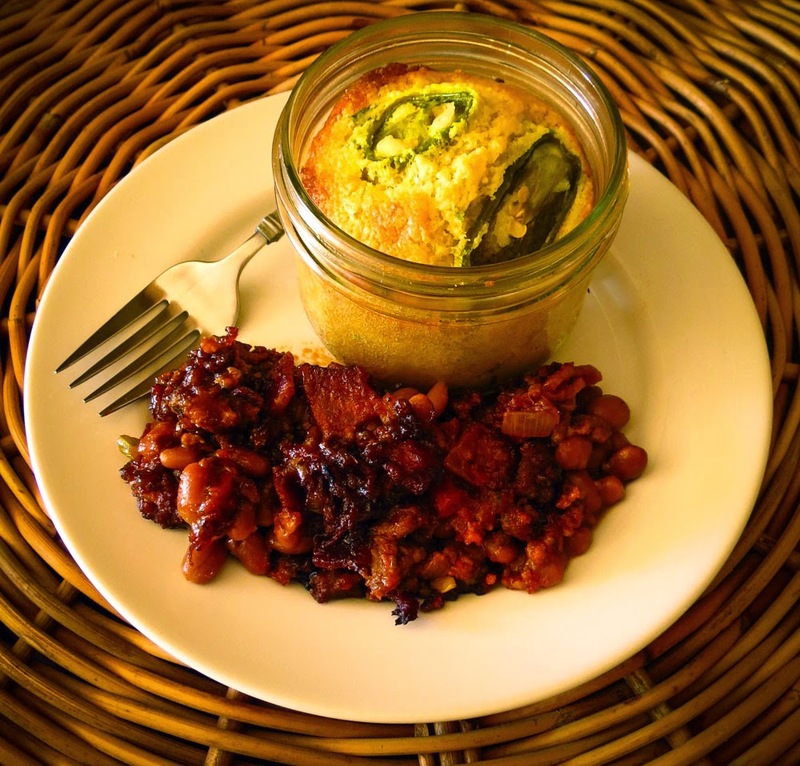 Turn the beans into a greased 2-quart baking dish, or two smaller casseroles. Spoon the meat mixture evenly over the top. Bake 45 minutes, uncovered, in a 350 degree F. oven. Serve, and enjoy the game. 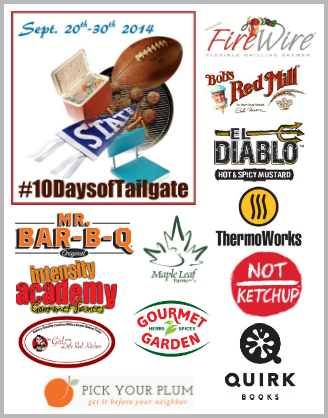 Remember to enter the #10DaysofTailgate Giveaway here. Go! Let's start with a huge - HUGE! - thank you to our event sponsors who have contributed great prizes for a gigantic giveaway. The fourteen - yes, fourteen - different prize packages are detailed in the rafflecopter. The rafflecopter is below and will go live on September 20th. Please check back, if you're reading this before our kick-off. Mandatory Entry: Leave a comment with What's your favorite tailgate dish? Many more ways to enter in the Rafflecopter widget [below]. The International Food Bloggers Conference (IFBC) opens this week in Seattle, an opportunity to spend 2 1/2 days with over 400 food bloggers. The agenda boasts a multi-strand focus on Food, Writing, and Technology... plus some food and wine tasting and a ton of personal networking opportunities. I can't wait to connect in person with some of the bloggers I only know online. and be uber sociable, but plan ahead for contacts you care about. Many attendees are organizing all sorts of pre-conference excursions and tours, runs, food crawls, pub crawls, breakfast meet-ups and casual networking occasions. The warm weather and sunshine this week should encourage our out-of-town visitors to get out and about, enjoying the best of Seattle. Fortunately the slate of featured conference speakers and array of educational sessions sound terrific; interesting enough to keep me focused on happenings inside the Westin. Between today and Saturday I need to identify my goals for attending this event. Why am I participating? Should I focus on food and recipe development, writing topics, or blogging and technology issues? What do I hope to take away from the experience? It's a challenge to be specific. Here's a peek at my tentative agenda for Day 1, a very relaxed start to what is sure to be a terrific, active weekend. Arrive late-morning and spend some time exploring Seattle's downtown. First stop, visit Penzey's Spices retail store (new to me since I usually order their product online) and then head off to Market Spice, a long-established local favorite. It's a comfortable downhill stroll to Pike Place Market to tour the food stalls, snack and nibble my way through some of the dining spots and shoot a lot of place and people photos. 4:30 - 6:30 PM A Taste of Washington Cookbook Launch and reception. I might need a restorative glass of wine or two after the hike back uphill from the Market to the Westin. Register for the conference, visit the Gift Suite, enjoy light bites, wine and meet more bloggers. Return home, solidify my game plan for Day 2 and get some rest 'cuz it's going to be a busy day. See for yourself; check out the entire agenda here. Disclaimer: I am attending the conference on a reduced blogger rate that requires three posts about the conference. Post image provided by IFBC. Lox - there's still one small chunk remaining in the fridge, part of the summer's salmon catch. I woke up thinking about that treasure, considering how to enjoy it this morning. So many choices! It's hard to beat the classic combination of thinly sliced lox piled on a fresh bagel, loaded with layers of cream cheese, red onion, capers, and a bit of dill weed. Each bite is salty, sour and tangy, smoothly creamy yet chewy, and downright delicious. 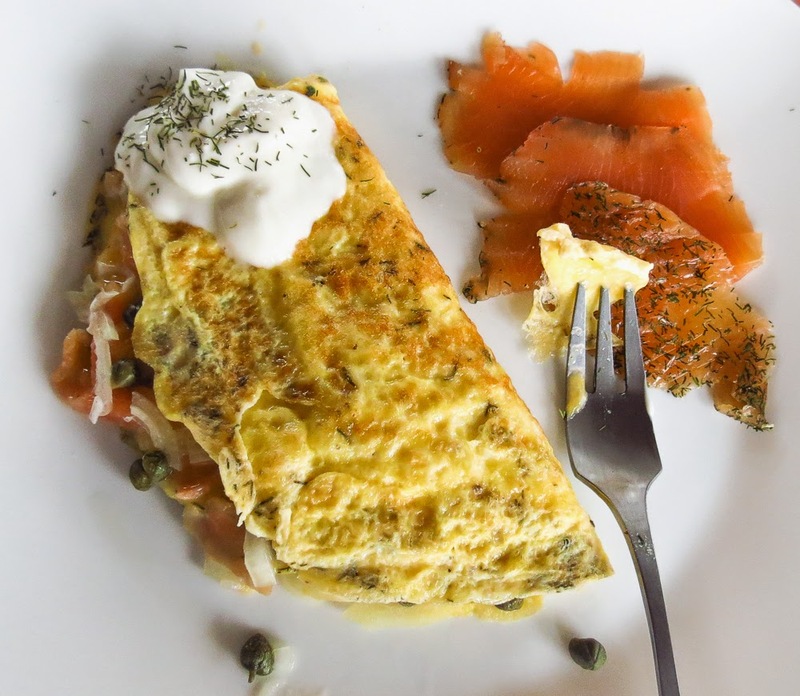 Those same ingredients (minus the bagel) plus some added bacon and soft cheese, translate well into the richly satisfying Lox Omelet Loaded With Flavor (link). Rich, however, isn't always a good thing, not if I want to fit in my jeans instead of sweatpants. Here's today's lighter version of that favorite breakfast dish, still tasty and satisfying but a lot less filling. 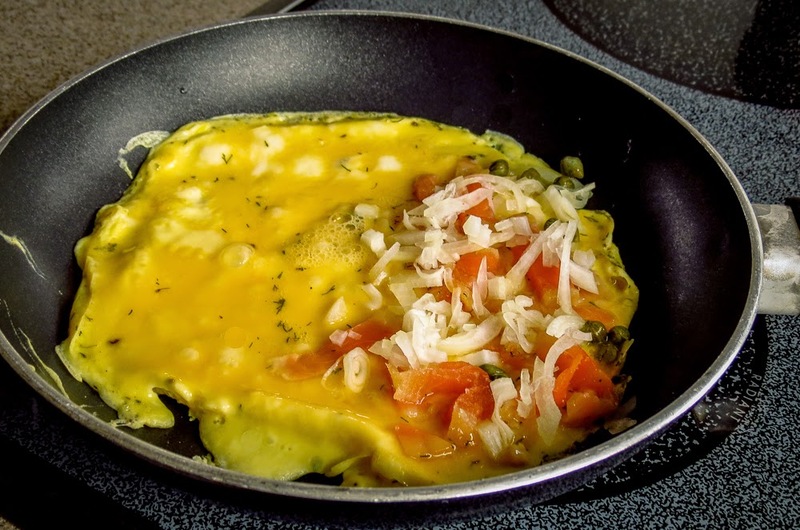 Photo: Omelet ingredients without any bacon or meltable cheese. 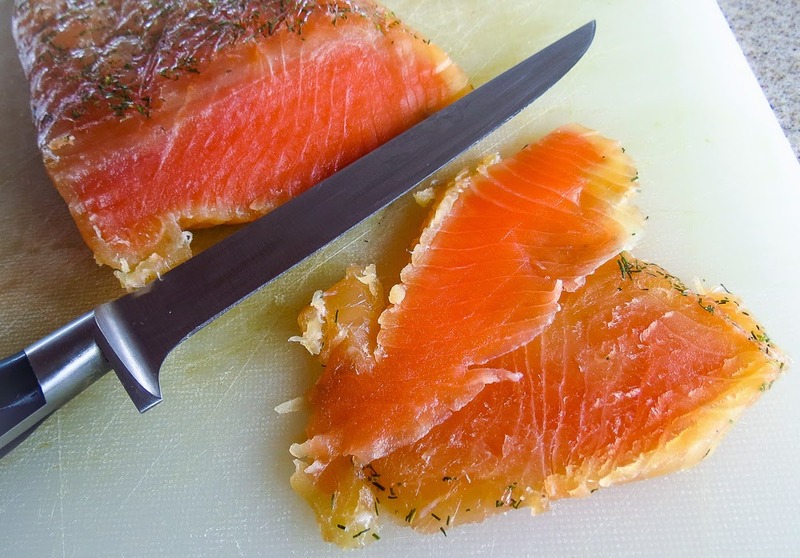 Photo: It's important to slice the lox super thin. 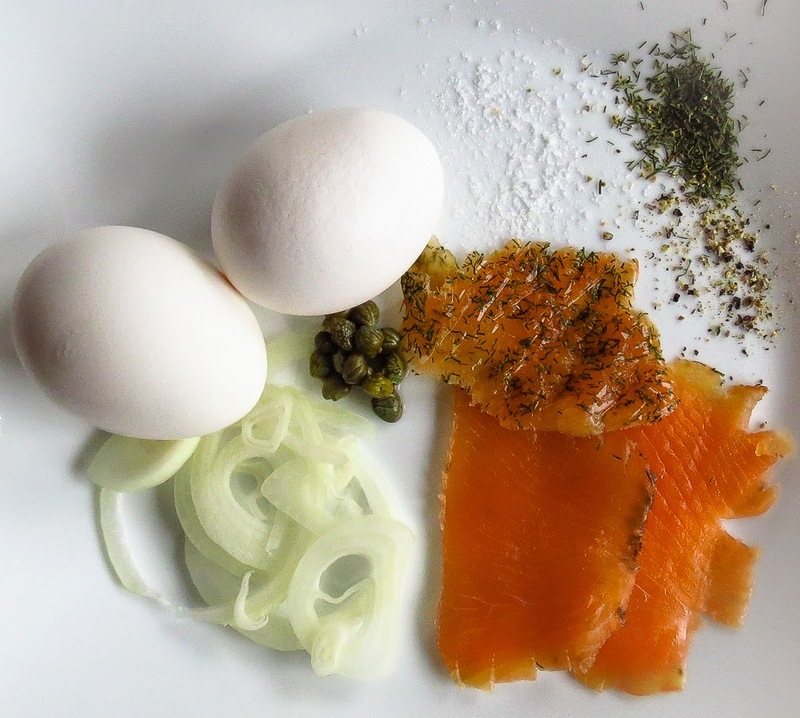 Photo:Barely-set omelet topped with slivers of lox, sliced onion, capers and a sprinkle of dill weed. 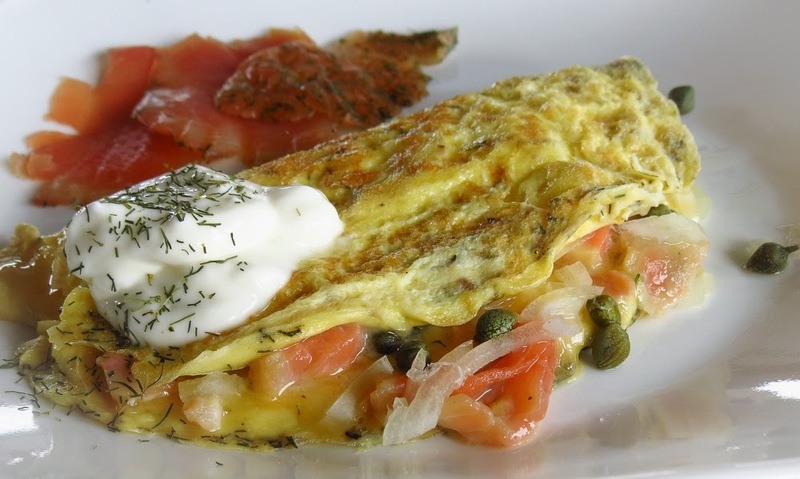 Photo: Lighter Lox Omelet topped with sour cream and a few more slices of lox on the side. Whisk eggs, egg white if using, dill weed and milk together in a mixing bowl. Heat a medium nonstick pan over medium-low heat. Add the butter and as it melts, rotate the pan to spread it out. Add the egg mixture and let it cook undisturbed for a bit to set the bottom. After the bottom begins to firm up, use a spatula to gently push the sides toward the center, tilting the pan to let the liquids run out to the edge. While the center is still somewhat moist but liquid no longer flows, scatter the pieces of salmon, onions and capers over the top. Season with salt and pepper, then fold one side over the other to form an omelette. Serve topped with sour cream and sprinkle the top with a bit more dill weed. Add a toasted mini bagel if you need some crunch.